1) Download the latest MonoGame release. 2) Download the MonoGame Dependencies and unpack into the ThirdParty\Dependencies folder. 3) Run Protobuild.exe in the root source folder to generate the build solutions. 4) Compile MonoGame.Framework.Android.sln in Release mode. 5) Copy the compiled MonoGame libaries into your C# project. 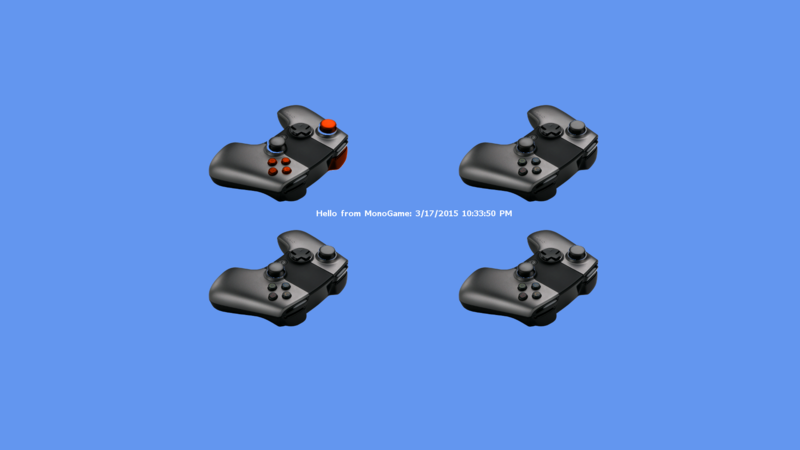 6) Learn MonoGame by browsing the MonoGame Samples. The auto update process requires that you use the same keystore in your app and every update. If you lose your keystore, it requires users to uninstall the game and redownload to get the next update. If you keep using the same keystore after that, the auto updating will continue as intended. It's important that your key signing, your package name, bundle identifiers, developer id, and the account that submits the game all matches. The above has to true for the in-app-purchases to function, since decryption depends on using the right signing key. MonoGame has an environmental build settings for advanced users to configure. These settings aren't for every game, but the following environmental tweaks reduce the amount of garbage collection thrashing. Right-click the solution and select the Restore NuGet Packages menu item if you see an error about This project references NuGet package(s) that are missing on this computer. 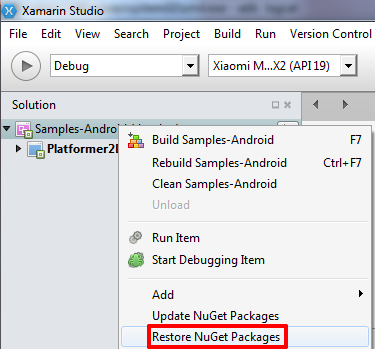 Enable NuGet Package Restore to download them. For more information, see http://go.microsoft.com/fwlink/?LinkID=322105.. In order to use MonoGame 3.5, the min API level has to be set to 16, target API level 21, and compile API level 21. MonoGame 3.4 added proper pause/resume support which allows textures and other content to reload when the game is reopened from the launcher. 1) In Visual Studio, right-click the MonoGame project and select properties. A target API of 16 or below will crash on launch with the unhandled exception System.MissingMethodException: Method 'AudioManager.GetProperty' not found. The target API of 21 is necessary starting with ODK 2.1.0 or better for Android TV support on Forge TV. Since OUYA uses API level 16, you'll have to use a MonoGame version prior to 3.4 to avoid runtime issues with OpenAL. OUYA-Everywhere Input remaps controllers as if they are an OuyaController. The screensaver will be disabled in the Activity OnCreate event by adding the OuyaInputView which also provides OUYA-Everywhere Input. After checking input, be sure to invoke ClearButtonStates at the end of the draw/update to clear the controller pressed/released states for the next frame. MonoGame uses the same axis constants that are used in the Java Cortex SDK. MonoGame uses the same button constants that are used in the Java Cortex SDK. GetAxis returns the axis value given the playerNum (0, 1, 2, or 3) and an axis constant. GetButton returns the button state given the playerNum (0, 1, 2, or 3) and a button constant. GetButton returns true if the button is currently pressed or returns false if the button is currently released. GetButton can also be used without the playerNum parameter to find if a button was pressed on any controller. GetButtonDown returns the last button state given the playerNum (0, 1, 2, or 3) and a button constant. GetButtonDown returns true if the last frame detected a pressed event. BUTTON_MENU should be detected using GetButtonDown. GetButtonDown can also be used without the playerNum parameter to find if a button pressed event happened on any controller. GetButtonUp returns the last button state given the playerNum (0, 1, 2, or 3) and a button constant. GetButtonUp returns true if the last frame detected a released event. BUTTON_MENU should be detected using GetButtonUp. GetButtonUp can also be used without the playerNum parameter to find if a button released event happened on any controller. 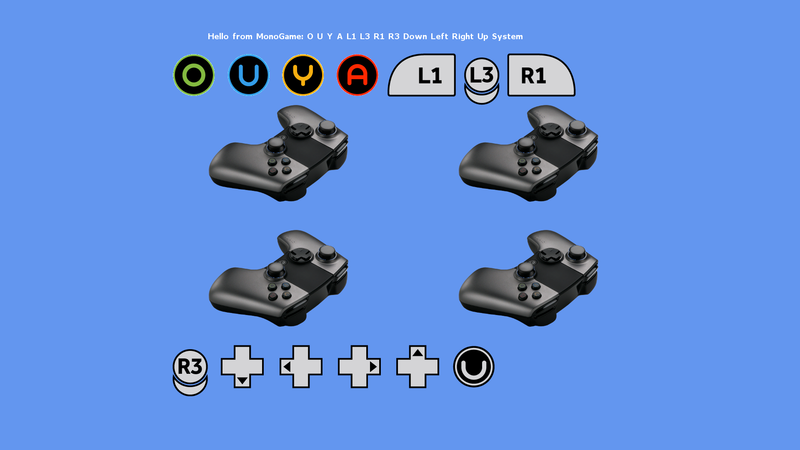 ButtonData gives you button names and button textures for the OuyaController button codes on the OUYA, MOJO, and Xiaomi consoles. ButtonData has a string name that returns the console specific button name. I.e. on OUYA the OuyaController.BUTTON_O name is O versus on the Xiaomi console as A.
ButtonData has a BitmapDrawable that can be converted to a Texture2D to be drawn in a SpriteBatch. The following examples are within the context of a class that extends Microsoft.Xna.Framework.AndroidGameActivity. Your game Activity will need to pass OnActivityResult events to the OuyaFacade. By extending RequestGamerInfoListener, the OnSuccess and OnFailure events can be overloaded and will be invoked when the asynchronous RequestGamerInfo method completes. By extending RequestProductsListener, the OnSuccess and OnFailure events can be overloaded and will be invoked when the asynchronous RequestProductList method completes. 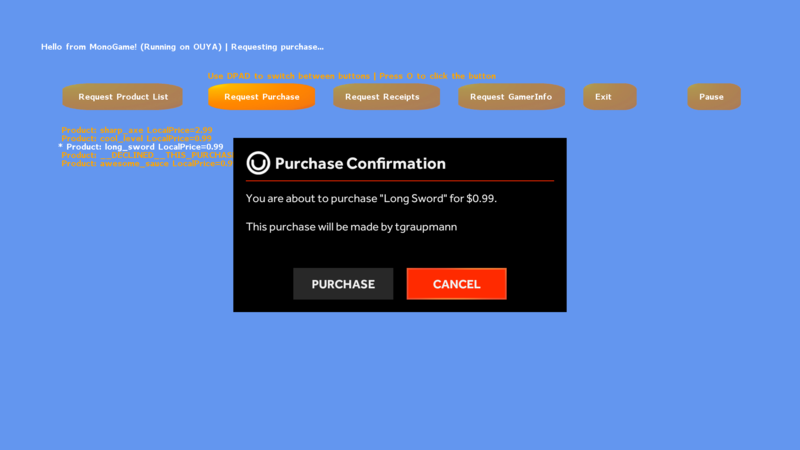 By extending RequestPurchaseListener, the OnSuccess, OnFailure, and OnCancel events can be overloaded and will be invoked when the asynchronous RequestPurchase method completes. By extending RequestReceiptsListener, the OnSuccess, OnFailure, and OnCancel events can be overloaded and will be invoked when the asynchronous RequestReceipts method completes. A common mistake is to leave sounds and music playing after the application has ended. If you used the XNA MediaPlayer object, be sure to Stop() when the user quits the application. MiGameCenterSDKService.apk should be set as AndroidAsset. SDK_MIBOX_2.0.1.jar should be set as AndroidJavaLibrary. 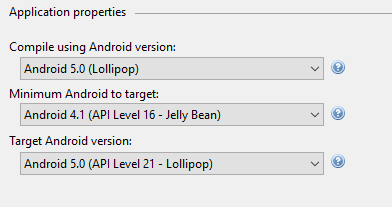 Some of the AndroidManifest.xml options can be edited in the Project Options on your MonoGame project. To add all the permissions, browse to your project Properties folder to edit the raw AndroidManifest.xml. MonoGame supports initialization strings similar to Java syntax to make the game compatible with OUYA Everywhere devices. MonoGame uses standard Android localization for localized string resources. 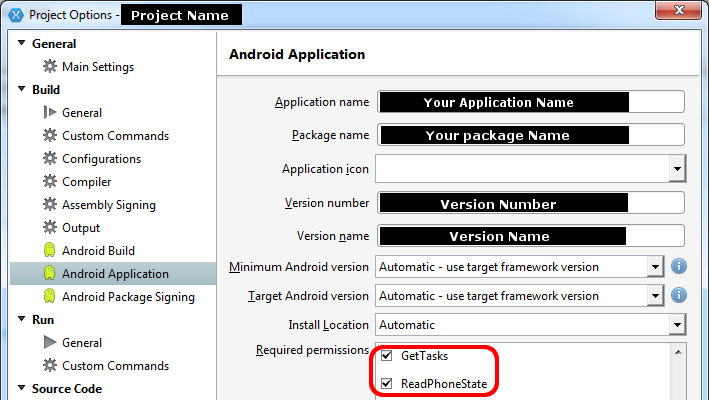 String resources must be included in the project and marked as an AndroidResource. Within the Activity or using a reference to the Activity, the resource strings can be found. The current Locale will automatically select the right String resource. Use the content view to disable the screensaver in MonoGame from the Activity before running your customized Microsoft.Xna.Framework.Game. This parallels the Java example using the Xamarin auto-generated bind syntax.